As the name suggests, Aquamare Beach Hotel and Spa means "The Water of the Sea’’ and what better way to celebrate this, than by enjoying a luxury stay right on the waters which produced Aphrodite, the goddess of love. 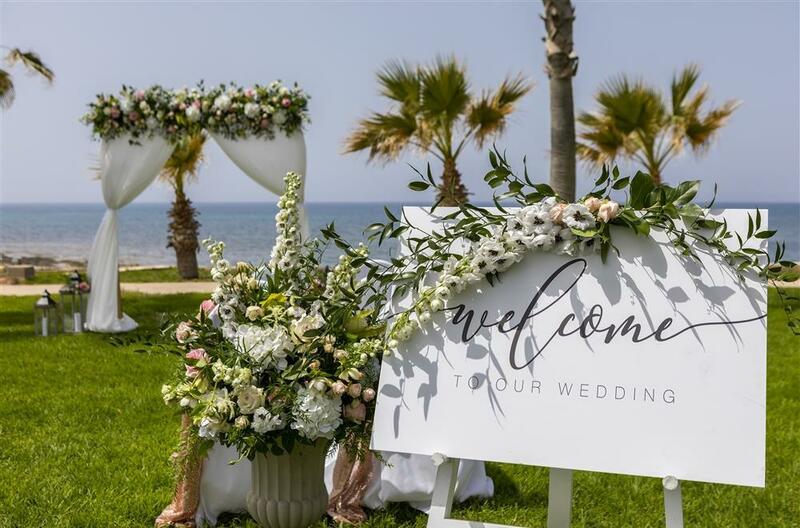 Aquamare Beach Hotel and Spa is situated just 3 km east from the renowned Pafos fishing harbour, near Tombs of the Kings, Paphos Lighthouse, and Paphos Archaelogical Site 3 km from the city center and 15km from Pafos International Airport. 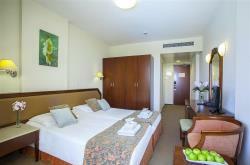 This Cyprus hotel itself consists of 116 standard rooms, 10 Superior Rooms and 2 One-bedroom Executive Suites. 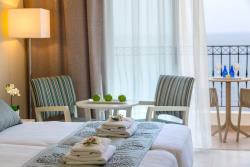 All are equipped with the modern conveniences you would expect from a luxury four star hotel. The Aquamare Beach Hotel and Spa recognises and respects the allure of the Mediterranean, which is why you will find that the entire focus is on capturing its magic and surrounding you with it during your stay. Enter an oasis of pure elegance and luxury. 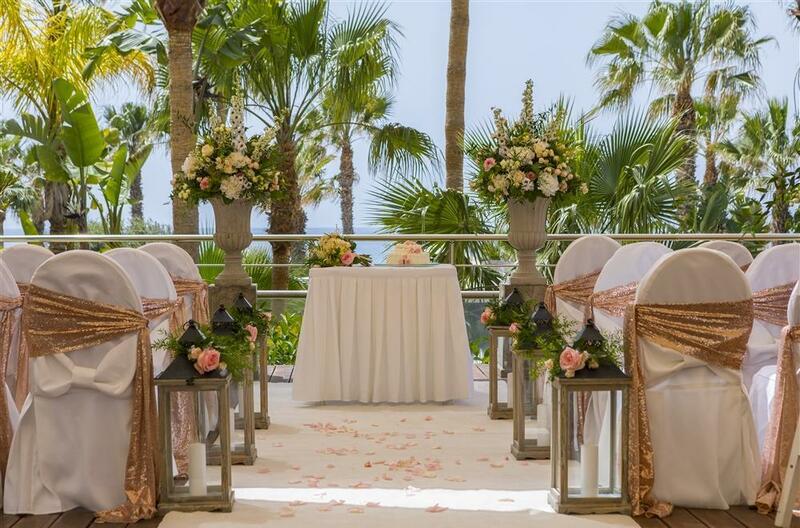 With attention to beautiful details and impressive facilities in a hospitable environment, the Aquamare Beach Hotel & Spa is the ideal destination for your next holiday or event. Offering a variety of restaurants and bars, conference & incentive facilities, wedding packages, indoor & outdoor pools, children's novelty pool, a fully equipped fitness centre and a luxurious spa, whether for business or leisure, there is something for everyone! To aid relaxation the hotel offers a number of spa treatments, massages and a steam bath, while leisure activities include a banana boat and aqua aerobics. Dining options include the elegant restaurant, where guests can sample the finest local and International dishes in comfortable surroundings. A complimentary bu ffet breakfast is served each morning at the Kirke Restaurant, and the half board rate includes buffet breakfast and dinner. Buffet, a La carte, and fine dining is offered for lunch and dinner at two of the resort restaurants, and there are three bars, including a poolside bar. To round off the day, the resort organises live entertainment and theme nights. 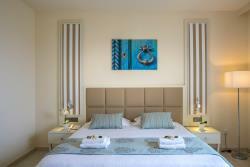 Guest rooms within the Aquamare Beach Hotel and Spa come equipped with all the amenities one would need for a comfortable stay, including en-suite bathrooms ensuring that your stay there will be unforgettable. 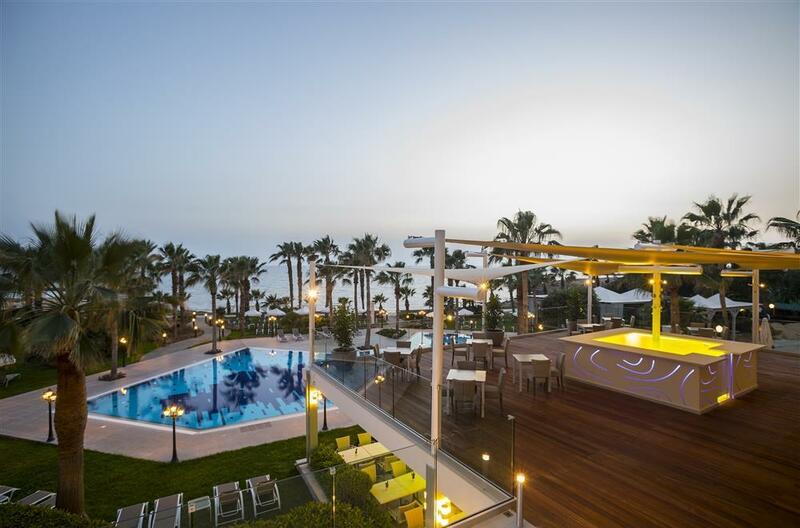 This Paphos property has a restaurant, a bar/lounge, and a poolside bar. Guests are served a complimentary breakfast each morning. Guest parking is complimentary. Event facilities consist of exhibit space, conference/meeting rooms, and banquet facilities. The staff can arrange event catering, tour assistance, and currency exchange. 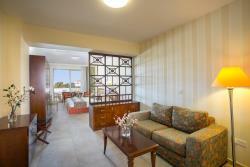 Additional amenities include a seasonal outdoor pool, a children's pool, and a children's club. 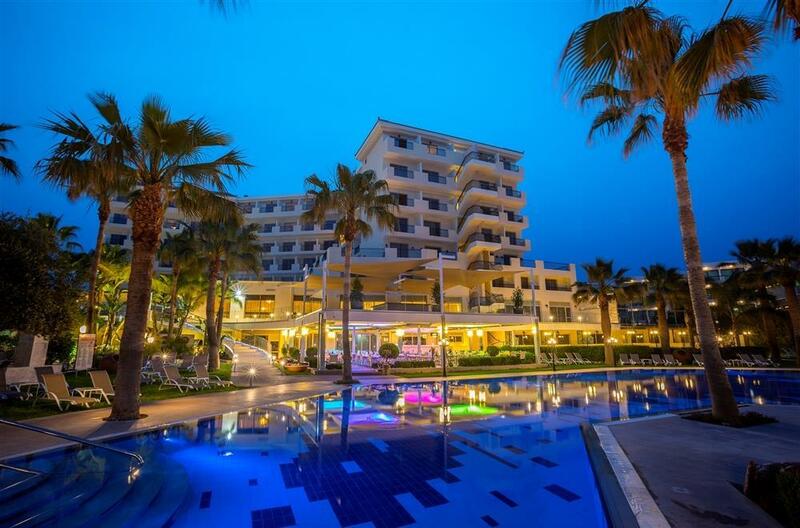 There are three on-site restaurants at the Aquamare Beach Hotel And Spa Paphos as well as a bar. The hotel also does wedding packages. For business travelers there are two conferencing rooms both equipped with digital supplies. This hotel was opened in the year 2006 and is considered a four-star hotel. Your stay at Aquamare Beach Hotel and Spa will remain an everlasting memory! 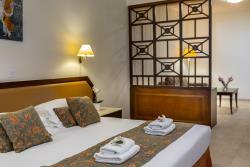 The hotel consists of 116 standard rooms, 10 Superior Rooms and 2 One-bedroom Executive Suites. 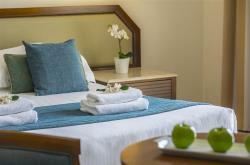 All rooms are equipped with the modern conveniences you would expect from a luxury four star hotel. Like the nectar of the Gods, the Ambrosia Restaurant will seduce any palette, whether it’s a lunch made with only the freshest ingredients found here in Cyprus or a dinner geared to satisfy almost any taste. Nereus, who in Greek Mythology was known as the god of the Mediterranean Sea, lends his name perfectly to the "A la Carte" fine dining restaurant at the Aquamare Hotel. Open only at night, the Nereus Fine Dining Restaurant will satisfy the most royal of palettes. 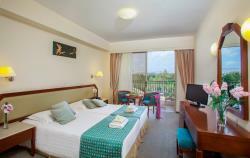 Located by the main outdoor swimming pool, serving beverages and snacks. Much like the waves which keep lapping gently on the seafront, the Kyma, (which means wave) Bar will keep you refreshed and relaxed with its welcome shelter. Found inside the hotel, the Nektar Bar is the perfect place to meet up for a pre-dinner aperitif or a post dinner cognac. In fact, whenever you want whatever you feel like, the Nektar Bar will have something to tickle your throat. For the most serious fitness enthusiast to the interested beginner, the hotel's L'Aqua Fitness Centre boasts the latest state of the art exercise equipment. 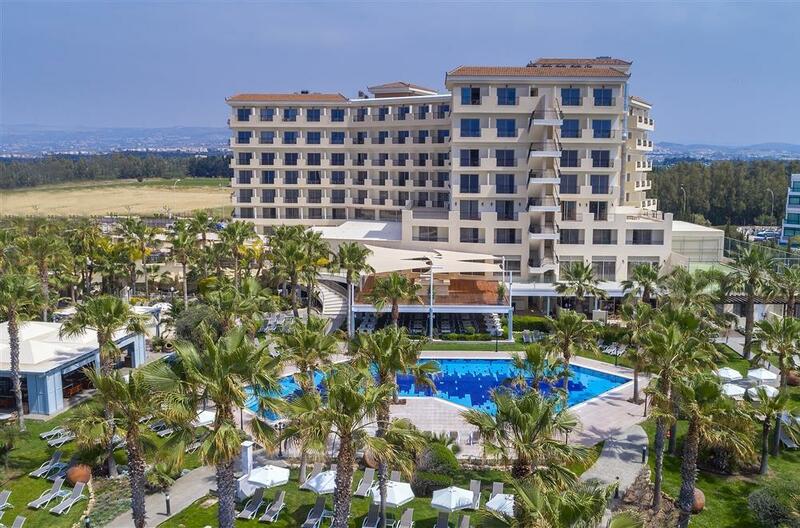 Aquamare Beach Hotel and Spa is situated just 3km east from the renowned Paphos fishing harbor, 3km from the city center and 15km from Paphos International Airport. Step into the surreal heaven that is L’Aqua Spa and allow yourself to escape the daily pressures of life. Enveloping you with beautiful surroundings and combining it with pleasurable treatments and impeccable service, ensuring total renewal. L’Aqua Spa is a luxury that every visitor can enjoy to their heart's content. Offering a unique range of treatments, ranging from therapeutic, de-stress and relaxing massages, facial and body treatments, exotic and oriental treatments, couple treatments, hydrotherapy treatments, saunas, hammam, steam bath and relaxation room. L’Aqua Spa will enter you into another world of sheer indulgence and relaxation. Based on the ancient healing method of Ayurveda, this uplifting treatment involves the massage of the upper back, shoulders, scalp and face. A unique treatment that will help reduce stress, fatigue and increase mental clarity. Offering a different approach to spa treatments, this treatment may be enjoyed by couples or two friends by where our signature L Aqua De-Stress Massage is combined with a relaxing Jacuzzi for two. A true fantasy! This exceptional facial helps to slow down the signs of ageing, reducing the appearance of fine lines and wrinkles via specialized massage tecniques and a Japanese Silk Mask infused with Pro-Collagen Serum. Following the Balinese tradition of sensuality, this opulent exotic wrap is ideal for skin smoothing and softening. Scalp and facial pressure point massage completes this stunning treatment ensuring delight for all your senses. An intensive facial treatment that will suspend the signs of ageing. Using concentrated high grade anti-ageing ingredients, the Payot exclusive 42 step modelage sculpting facial massage and a lifting mask, results will be immediate. Your body will be enveloped with a combination of Zinc, Calcium and Copper together with Grapefruit and Orange essential oils in a warm wrap to eliminate toxins, fatty deposits and water retention.